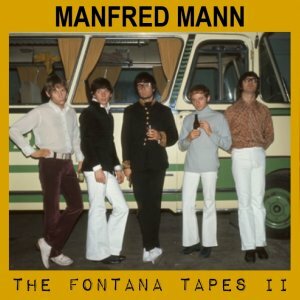 All material on Manfred Mann - The Fontana Tapes are unreleased mixes or songs, because even for the hits and album tracks in that collection you are hearing different mixes that show the various overdubbing stages and have the raw, unfaded endings. 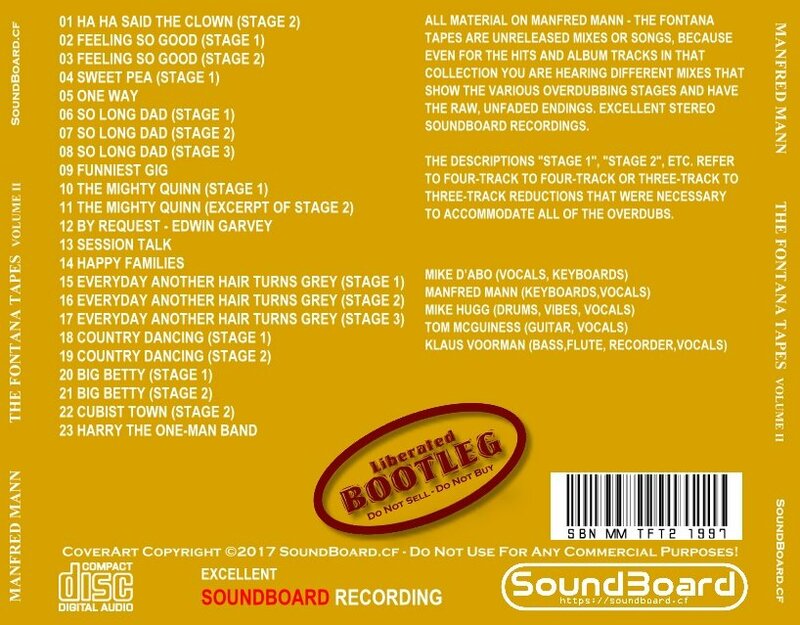 Excellent stereo soundboard recordings. 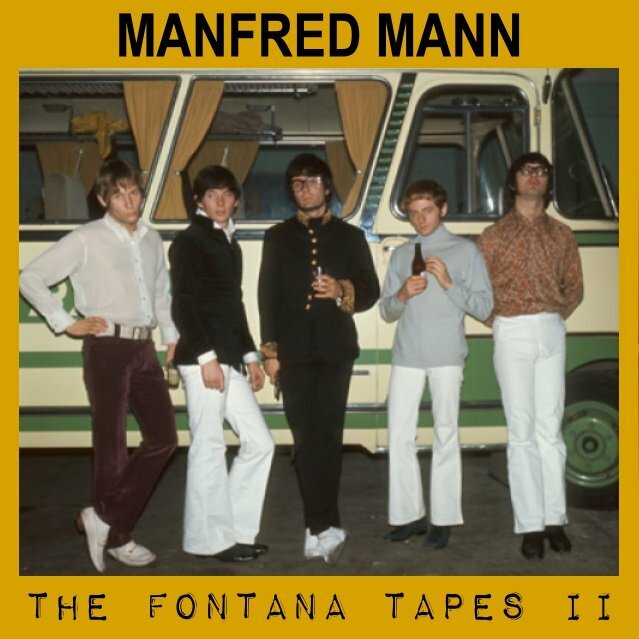 At an early stage of tape research towards what later became the two-CD set “The Ascent of Mann”, an American compiler who worked for both Universal Music & EMI (who prefers that his name not be mentioned publicly) took a large batch of Manfred Mann three-track and four-track tapes to Abbey Road Studios, to listen to the tapes and make rough stereo mixes. In the end, the compiling job went to another compiler, and so none of these mixes were ever released. The compiler who assembled the released two-CD set was given a £3,000 mixing budget, and he decided to (mostly) spend the money on remixing unreleased songs, rather than making first time stereo mixes of mono singles. But these rough mixes do present first time stereo mixes of numerous non-LP singles tracks, and they present over an hour of unreleased songs, unreleased “jazz” instrumentals and demos. Some highlights include an alternate arrangement of “Each & Every Day”, the “lost” psychedelic version of “Up The Junction”, a rare lead vocal from Klaus Voorman on “I Want To Be Wanted” and first time stereo mixes of “Ha Ha Said The Clown” (with a very different, discarded ending), “Funniest Gig”, “Feeling Too Good” and many, many more. The descriptions "Stage 1", "Stage 2", etc. refer to four-track to four-track or three-track to three-track reductions that were necessary to accommodate all of the overdubs. Personnel on “The Fontana Tapes” is Mike D’Abo (vocals, keyboards), Manfred Mann (keyboards,vocals), Mike Hugg (drums, vibes, vocals), Tom McGuiness (guitar, vocals) and Klaus Voorman (bass,flute, recorder,vocals), excepting “Let it Be Me” and “I Wanna to Be Rich” which have Jack Bruce (bass, vocals). NOTE: At the end of Disc 4, there is an attempt at remixing Jimmy Page’s 1965 solo single for stereo. However, it was discovered that Page’s only-ever lead vocal on “She Just Satisfies” was performed directly into the 1965 mono mix, so the multitracks are strictly instrumental. Professor Red says: I am overwhelmed by the sweep of these sessions. Perhaps it should be noted that the version of Manfred Mann’s Seasons In The Sun, as far as I know, has never appeared on any Mann official or unofficial release. The Fontana Tapes II 0 out of 5 based on 0 ratings. 0 user reviews.